At a small or mid-sized company, it’s often HR’s most essential responsibility: ensuring employees get paid accurately and on time. Unfortunately, “essential” rarely translates to simple. Payroll consistently ranks as HR’s biggest administrative headache, sapping time from what should be the profession’s primary concern: the success and growth of employees. Whether you’re just getting started or consider yourself a grizzled veteran, we’ve compiled everything you need to know about payroll. How do you settle on a pay cycle? How do you keep track of federal and state taxes? We’ll cover all of these questions and more below. Regardless of how often it hits, everyone loves a payday. Pay frequency is a divisive issue in the payroll community, and everyone has their own preferred model. When determining how often employees should be paid, U.S. businesses opt for one of four models: weekly, biweekly, semimonthly, or monthly. According to the U.S. Bureau of Labor Statistics, biweekly is the most popular pay frequency among employers nationally. As you might suspect, it involves paying employees on a set day every other week, ultimately resulting in 26 paydays per year. That means that for certain months in the year, employees will receive a whopping three paychecks. Biweekly tends to be most preferred by both businesses and their workers, as employees get their pay in a predictable, frequent manner and employers only have to process every other week. In the payroll profession, the biweekly model is the closest thing to a happy medium. The second-most common frequency in the US is the weekly model, in part due to its popularity in blue collar industries like manufacturing and construction. For lower wage or hourly workers, the weekly model is preferable because it makes for easier financial planning. It’s also preferred in contract work like construction, where work can stall suddenly for a variety of reasons, like a client running out of funds. For payroll professionals, these same virtues make the model exceeding difficult to administer, with the dreaded “processing day” occurring every single week. Under the semimonthly model, employees are paid twice a month—once in the middle of the month, the other at the end. The resultant 24 pay periods can be challenging for payroll professionals to track, as the 15th and 30th often fall on a bank holiday or weekend. In these instances, the best practice is to pay employees on the preceding business day. This variability can sometimes frustrate employees, as it makes planning to pay the bills more of a challenge. And monthly payroll? You guessed it—that’s 12 pay periods per year. While that may make processing sound like a breeze, a month is a long time to wait for a paycheck. Because of this, the model is very much a rarity today, with just 11 percent of U.S. businesses opting for a monthly pay cycle. Why bi-weekly is the most popular paycycle? It’s an adage you’ve likely heard before: ”In this world nothing can be said to be certain, except death and taxes.” On payroll processing day, Ben Franklin’s words of wisdom ring as true as ever. Payroll taxes, put simply, are deductions made to employee pay to fund federal, state, and local governments and services. That doesn’t mean that employees shoulder the burden exclusively, though—employers, too, must pay their fair share come payday. Federal Income Tax: A set percentage based on an employee’s income. The amount you withhold is based on what the individual indicates on their Form W-4. Social Security and Medicare (FICA): The Federal Insurance Contributions Act (FICA) tax is paid for by employees and employers to fund Social Security and Medicare. Both parties are required to pay 6.2 percent (for Social Security) and 1.45 percent (for Medicare) on payday.If an employee’s year-to-date income reaches $127,200, the social security contributions stop for that tax year. After its reaches $200,000, the employee contribution to Medicare goes up an additional 0.9 percent for that year. Federal Unemployment (FUTA): The Federal Unemployment Tax Act (FUTA) is a 6 percent tax paid by employers based on employee wages. The tax supports unemployment compensation for individuals who have lost their jobs. After an employee’s year-to-date wages cross a certain threshold ($7,000), an employer no longer has to pay the tax. Supplemental Income Taxes: Wages outside of regular compensation (like bonuses or severance) have their own, higher tax rate. We’ll cover this later on in the guide. The above only covers what’s due to Uncle Sam. State and local taxes are a little more challenging to sumup. Most states have separate income taxes complete with their own tax brackets, or tables showing how much individuals should be taxed based on their earnings. Many cities have their own tables as well (here’s New York City’s, for example). In addition to these taxes, states also have their own unemployment insurance (SUI) rates, which vary from employer to employer. Your company should receive a letter from your local labor department with your business’s SUI rate each year. 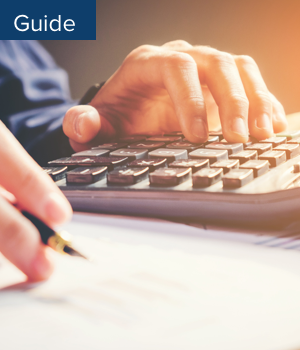 You can use our state tax guide to see what requirements apply to your business, or just visit your state and city’s department of labor or finance. This wouldn’t be a real payroll guide without mentioning forms, right? From tax filings to annual wage summaries, the number and variety of forms you’re required to file can be dizzying. While the vast majority of employers are required to file a Form 941, there are other forms for more specialized cases. If you have agricultural workers, for example, you may need to fill out the Form 943. An exhaustive list of similar forms is provided by the IRS here. There are state and local equivalents to the Form 941, too. Check with your local tax agency’s website to see which forms you’re required to file. Some localities, like California, may actually require you to fill these out online anyway. Learn how technology has finally solved the riddle of year-end reporting. In addition to the above, there are two other federal forms you’re likely already aware of: W-2s and 1099s. Both are used to report individuals’ compensation, but the specific circumstances in which each are issued varies. The Form W-2, or Wage and Tax Statement, includes a summary of employees’ compensation and deducted taxes. It must be provided to employees and filed with the Social Security Administration (SSA) by January 31. When filing these forms with the SSA, be sure that they’re accompanied by the Form W-3, a summary form that serves as a “cover page” for all of your company’s W-2s. Make a mistake on an employee’s W-2? It happens—you can make corrections with the Form W-2C. 1099 forms are used by individuals to report a number of things—interest, dividends, retirement withdrawals—but for employers, they’re best known for including payments made to independent contractors. If your business pays an independent contractor $600 or more in a single year, it’s required to file and provide that individual with the Form 1099-MISC by January 31. Sound familiar? Thankfully, that deadline should be easy to remember. Last but not least, there’s the Form W-4, or the Employee’s Withholding Allowance Certificate. This form is a mandatory part of the employee onboarding process, and it determines how much federal income tax should be withheld from an individual’s paycheck. On the form, employees fill out a “personal allowance worksheet” based on their marital status and other personal factors to determine how much should be withheld from their pay. The more allowances specified, the less income tax ends up being withheld from regular pay. It’s best practice to have employees review their W-4 whenever their personal or financial situation changes. There are a few instances where it’s recommended or even required to have current employees fill out a new form, like a legal name change or marital status update. Employees who are claiming tax exempt status need to fill out the form every year by February 15. Even though the Fair Labor Standards Act (FLSA) is nearly 80 years old, it arguably remains the most important piece of HR and payroll legislation in history. Once considered a novelty, the law set a minimum wage, established rules for overtime pay, standardized record keeping, and made child labor illegal. Though aspects of the law have undergone revisions since then, the FLSA’s spirit lives on to this day. The FLSA established the 40-hour work week as a standard. In doing so, it created a new classification of work that went beyond those parameters: overtime. The law sets rules for who should be paid overtime, in what circumstances it should be issued, and at what rate. There’s more to overtime than a salary threshold. Read our guide on the nuanced "duties test." We’ve written about the subject at length, but here’s the gist: if an employee’s job duties and wages don’t meet a minimum requirement, they will need to be paid “time and a half” for any time exceeding 40 hours per week. As of this writing, employees earning less than $23,660 a year must be eligible for the benefit, regardless of their job duties. Don’t get too comfortable with this figure, as there’s a good chance the threshold will increase in the near future. The Department of Labor (DOL) is flexible on your actual method of timekeeping. Whether it's a physical time clock or paper form filled out by employees, the agency leaves it up to businesses to make the call—as long as the timesheet results in employees being paid for the regular and overtime wages they’re entitled to. As a practical measure, ensure that whatever method you use can easily be imported into payroll. Though the FLSA sets a national baseline for employers, state and local agencies often enforce their own minimum wages and overtime rules. The rule of thumb for employers in jurisdictions where standards contradict is as follows: when in doubt, the rule most generous wins out. In New York City, for example, employees will need to be paid a minimum of $13 per hour despite the fact the federal minimum wage is $7.25 per hour. Conversely, even though Georgia’s minimum wage is technically $5.15, employers in that state must abide by the more generous federal minimum. The same dynamic applies to overtime rules, too. Be sure to check with your state department of labor or city agency to confirm the rates applicable to your business. Exempt or Non-exempt: Are You Classifying Employees Correctly? In the vast majority US workplaces, direct deposit reigns supreme. A survey from the American Payroll Association found that over 96 percent of employees received their pay using direct deposit. In addition to being easier on the employees, this method of payment can reduce your printing costs and is greener, too. Boston University calculated that its own push for direct deposit adoption would prove to save 3,000 pounds of paper, 30,000 pounds of wastewater, and 1,000 gallons of gas annually. Oh, and it saved them a pretty penny too—just about $50,000 per year. Paycards have emerged as a cost-effective (and controversial) way for employers to pay their employees. Under this approach, employee pay is automatically loaded into a physical, plastic card. Individuals can use their paycard as they would a credit or debit card, using it to make purchases or by withdrawing funds from an ATM. Because they can save employers up to $233 per employee annually in payroll processing fees, they’ve grown in popularity since their inception in the late 1990s. Despite paycards’ growing popularity with businesses, feelings on the payment method are markedly less positive among employees and labor groups. Due to the hidden fees some providers charge for cash withdrawals and paper statements, this method has been derided by some lawmakers as a form of wage theft. In light of this, a number of states have drafted laws heavily limiting or regulating their use. Paycard use has yet to be directly addressed at the federal level. Last but not least, some individuals may still opt for the classic paper check. In some jurisdictions, you may need to oblige that request. If you don’t process payroll in house, make sure your vendor can accommodate check printing. Given all the options, it may seem tempting to settle on direct deposit as the way to go. Even so, note that it’s the employee, not you, who often has the most say in choosing a payment method. Federal, state, and local laws closely guard rights on payment. At the federal level, employers are permitted to require direct deposit adoption, as long as workers can use a bank account of their choosing. If an employer wants to require that employees use a certain bank, only then must it offer an alternative form of payment as well. State laws are much more restrictive—in New York, for example, employers must offer cash or check payments in addition to direct deposit. Check with your respective state labor department to confirm local rules. Additionally, depending on your jurisdiction, you may be required to provide employees with a pay stub on payday as well. While it’s not mandated by federal law, doing so has become best practice and has evolved into an employee expectation. The best pay stubs go further than just providing employees with a breakdown of recent or year-to-date compensation—they display accrued and used vacation and sick time, too. Payroll isn’t always routine. Depending on the occasion, you may need to make payments that fall outside of the regular pay cycle. Bonuses, commission, and severance are considered “supplemental wages” by tax authorities. If you’ve ever received or processed a bonus in the past, you’ll notice that it often displays as a separate line item on the employee pay stub. Those on the receiving end of one of these payments shouldn’t be surprised to see that their bonus or commission has been nearly cut in half. Supplemental wages carry a much heavier tax burden that regular payroll. For administrators, there are two acceptable methods for handling these taxes. Thankfully, the easier method often makes the most sense for both the administrator and employee. The easy, or percentage-based approach, applies a federal flat rate (25 percent, as of 2017) to the bonus. Note that particularly big payouts of $1 million or more are subject to a higher supplementary tax rate of 39.6 percent. In addition to the supplementary rate, note that other taxes like Social Security and Medicare will also need to be deducted from the payment. A number of states have their own supplemental income rates as well. Check with your local tax agency to confirm yours. Navigate federal and state tax rates with our 2017 tax guide. Both of these methods are acceptable in the eyes of the IRS. 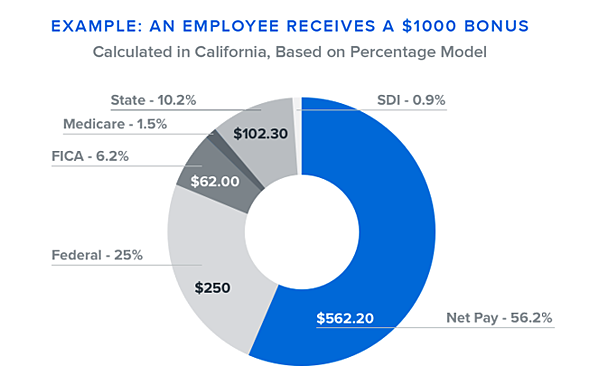 In most instances, the simpler percentage based model will result in a higher payout to the employee and less head scratching on your part. Depending on the circumstances of the payment and your company size, it may be feasible to just ask employees which method they prefer. Without giving direct tax advice, explain the two methods to employees or defer the conversation to your third party processor if you have one. Any vendor worth their salt should be able to accommodate both methods. In light of the function’s growing complexity, outsourcing payroll has increasingly become more of the norm, not an exception. Among companies with 500 or fewer employees, nearly 60 percent turn to a third party vendor to administer payroll. With regulatory changes happening at every level of government, it’s a safe bet that an even larger share of companies will turn to outside help to manage payroll compliance. Dotting your i’s and crossing your Form 941’s is often too much to ask from one person. Thankfully, there are several payroll technology vendors and professional communities, like the American Payroll Association, that your HR team can lean on to ease the burden. Namely, for example, processes over $6.5 billion in annual payroll and handles compliance for over 800 companies. You can learn more about our full payroll offerings here. The end result? Spending less time crunching numbers and fretting about FLSA or IRS compliance—and more time empowering employees to be their best selves. Disclaimer: The content of this publication is provided for informational purposes only and does not contain or constitute tax or legal advice. You should not act on this information without seeking tax or legal professional counsel. It was last updated on September 1, 2017.